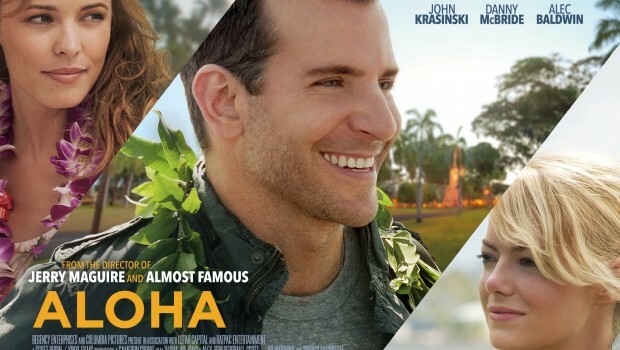 Aloha is a romantic comedy that stars Emma Stone and Bradley Cooper leading a cast with so much talent, and that talent was largely underused and unfortunately just in a not so good movie. Looking back, you also have Rachel McAdams, John Krasinski, Bill Murray, Alec Baldwyn, and Danny McBride, these are all quality actors in the romance/comedy genres but none of them really shine in this film that has overall messy writing. The movie has so many shifts in tone and pace that it is very uneven from start to finish where some moments are rushed and some are dragged out for a while. There were brief moments of comedy here and there but nothing really to deem this movie a romantic comedy, it got me to chuckle a few times throughout but they were so spaced out that by the end the romantic emphasis trumps whatever comedy there was. John Krasinski was the source for 80% of the comedy in this film, pretty much every time he was on-screen i was laughing, not the laugh out loud kind but a good chuckle, so he bought a nice lighthearted feel to the film. Now, Emma Stone’s character Allison is the most interesting character in this movie, not in a good way but also not in an extremely bad way. I feel like they made a mess of her character, she felt like a blend of a few different characters that take over her body at different points in the movie. Very early on i was liking the character, her quick talking and confronting personality really clashed and contrasted with Brian (Bradley Cooper) pretty well. But that quickly changed when within 30 minutes she was really getting on my nerves and i was thinking that she should get the ‘X-Men Origins’ Deadpool treatment ASAP. But then, by the 1 hour mark she calmed down and was simply playing a love interest or one corner of the love triangle for the rest of the movie. And she kinda goes in and out between these three states briefly throughout the film. It would have made sense if there were events forcing her to change in certain ways but the only reason she was changing so much was because the script said so. The plot is very weak for most of the film, you occasionally have 10 minute bursts where the NASA based main plot takes control but those moments are very few and you only really piece together what is happening and why later on in he movie. At the other moments it is the romantic elements that drive this movie at a slow pace towards the end. Even though i thought that Bradley and Emma’s characters had good chemistry and Bradley and Rachel’s characters also related well i thought that some of the events that happen between them weren’t natural. The inclusion of the love triangle that kind of exists for some of the film only adds to the list of romantic film cliches to be found. The movie doesn’t offer anything new but was still a pretty watchable experience, i never found myself wanting to turn off the movie because i was for some reason still mildly entertained.